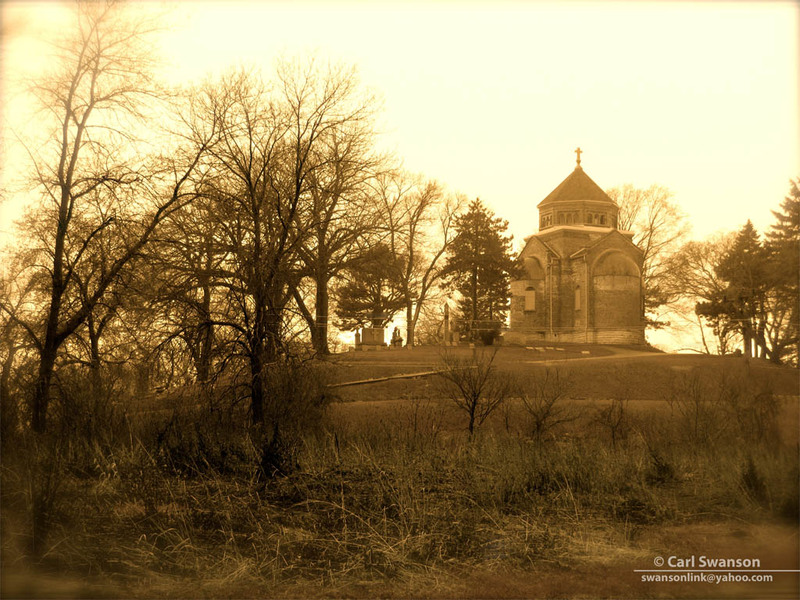 The mausoleum beneath the 1899 Cream City brick chapel in Milwaukee’s Calvary Cemetery seems an ideal last resting place. The elegant little chapel features soaring arches rising to a domed ceiling, a rose window, and a high altar. It was designed by Erhard Brielmaier, the same man responsible for Milwaukee’s Basilica of St. Josaphat. It’s location is significant too. Overlooking today’s Miller Park, the chapel stands at the eastern edge of Calvary Cemetery atop one of highest elevations in Milwaukee. Called Jesuit Hill, it is largely given over to burial places of clergy and members of Catholic religious orders. It was the location of a large wooden cross until the chapel’s construction. The cemetery itself contains a great deal of local history. Consecrated in 1857, it is the oldest major Catholic cemetery in the city. The grave of Solomon Juneau, co-founder of Milwaukee, is here, along with brewer Frederick Miller, meat packer Patrick Cudahy … and architect Erhard Brielmaier. The chapel Brielmaier designed is brightly illuminated in daylight hours by the windows surrounding the base of its dome. The chapel served for several decades as a place of prayer, contemplation, and religious services. However, the building has no climate control system and gradually the cycle of freezing and thawing took a toll. By the 1950s the building was no longer deemed fit for use, and it was closed up for nearly 50 years. In 1992, the Catholic Archdiocese of Milwaukee announced plans to tear down the chapel. 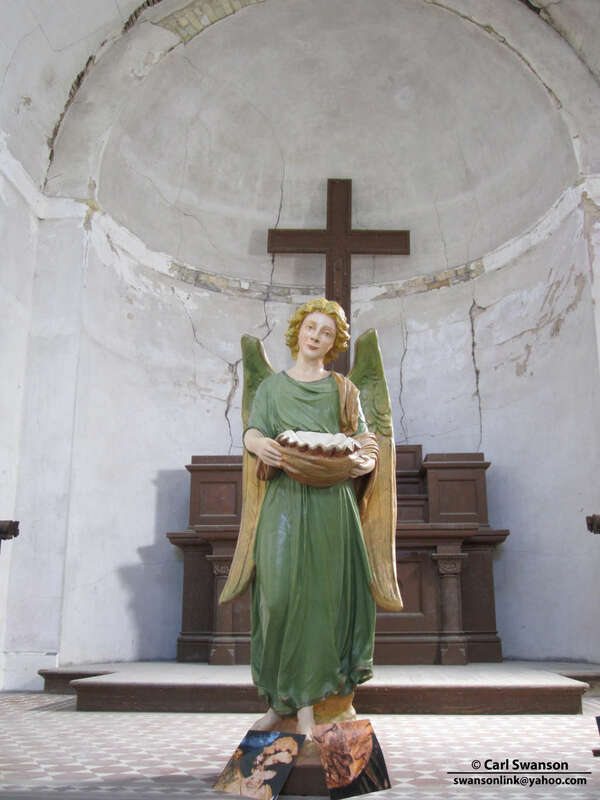 A group of concerned residents banded together to form the Friends of Calvary Cemetery and won the archdiocese’s backing for their plan to secure the building (by then a target of repeated vandalism), stabilize the crumbling structure, and restore it to its former glory using volunteers to raise the needed funds and do much of the work. Interestingly, a mausoleum was built under the chapel and was exclusively intended for entombment of members of Milwaukee’s Catholic clergy. Built on two levels, it has niches for 45 tombs. In 1903, shortly after the chapel’s dedication, the coffin of Rev. 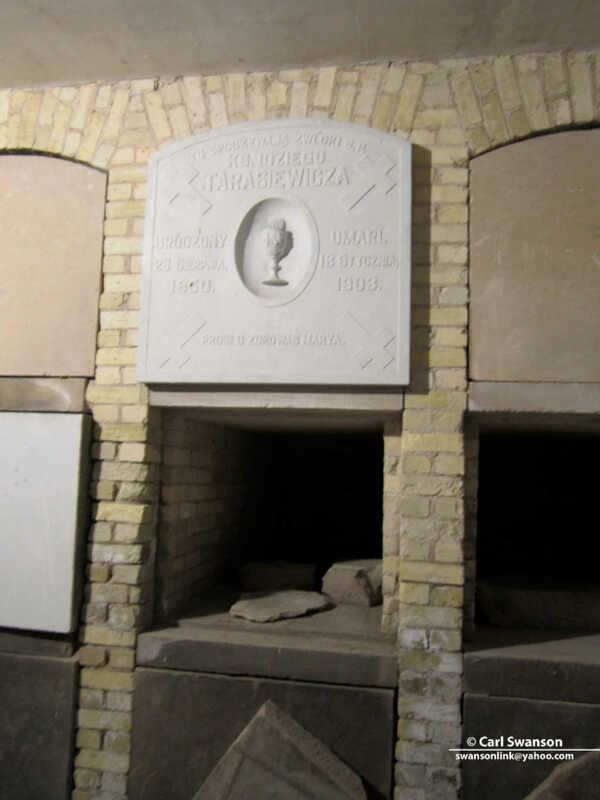 Idziego Tarasiewicza, Catholic priest, native of Poland, one-time Russian soldier, and the first pastor of St. Casimir’s Parish in Milwaukee’s Riverwest neighborhood entered the crypt through the wooden doors of the coffin entrance in the side of the hill. He was laid to rest directly under the high altar behind a marble marker. And that was it. After a while, the coffin entrance was bricked over as well. In the past 110 years no further remains have been placed in the mausoleum. You can visit the chapel, enter the crypt to pay your respects to Father Tarasiewicza, and ponder a true Milwaukee mystery. In recent years it has been open to the public on Memorial Day and during Doors Open Milwaukee. Elsewhere on the grounds, you can visit the grave of a confederate veteran of the Civil War. You can read about the controversy over his headstone here. This is an interesting article. Thank you. I wonder if you can tell me anything about old, abandoned cemeteries in Wisconsin? My gggrandmother died in 1856 in Milwaukee but I can’t find her in any cemetery. I was told once there was a missing cemetery that was used back in the day? There were several cemeteries that were overtaken by the city’s growth. Generally efforts were made to dig up and respectfully rebury remains in other cemeteries. I wrote about one example here and that article cites a newspaper story detailing early pioneer cemeteries. Good luck!